One of the most relevant developments within the visual mapping arena is the release of The Brain 7. It's basically mind-visual-knowledge mapping on steroids. Quite awesome actually: and if you have arrived at a point of requiring a visual information management relational data base tool to enhance, improve and exponentially propel your knowledge management skills; 7 may be for you. Imagine having access to a most capable front end visual information management interface that also offers a cross platform desktop to cloud service for personal, academic and corporate business information management, collaboration and team connectivity. 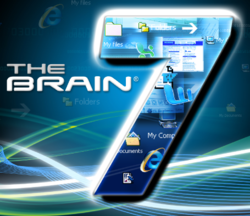 TheBrain Technologies, the leading provider of dynamic visualization and knowledge management software is the developer of TheBrain 7. The software enables people to connect information into infinite mind maps, modeling thinking and relationships in the real world. The Brain 7 has certainly come of age, and as an affordable and intensely supported product; The developers at The Brain Technologies are focused on enhancing and exponentially improving the potential for effective knowledge mapping. The information manager of this century will no doubt see within The Brain 7, an extremely powerful tool for effective information to knowledge management processing.